Cut each sausage into 3 pieces. 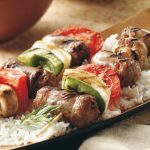 Thread on 10-inch skewers, alternating with bell peppers, tomatoes, mushrooms and onion. Mix vinegar and olive oil in a bowl for basting. 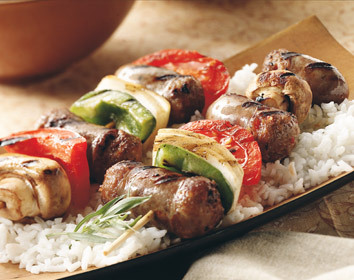 Barbecue or broil the kabobs on medium heat for 20 minutes, basting and turning occasionally. Serve over rice or polenta. Makes 4 servings.